Wordcrasher, from developer Kevin Ng, is like the brightly colored lovechild of Scrabble and Tetris. If you’re at all familiar with those two games, this one is a breeze. The graphics won't impress, but the challenge will. 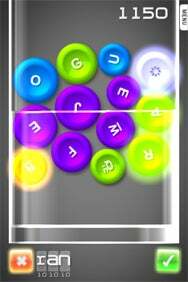 Neon letters fall from the sky, and you must tap at least three of them in succession to create a word, then hit the green button to eliminate the letters. Letters are assigned a point value, so longer and more creative words rack up the points. Tilt the screen to shift pieces and fill in gaps between them, or swipe downward to make the letters fall faster. If you’re not quick enough and the screen fills up, it’s game over. The concept is simple and easy to master, but there are a few extras to keep it interesting. There are two modes of play to choose from: “Marathon” is a basic game where pieces fall and you try to eliminate them whereas “Flood Panic” ups the ante by having the pieces land in quickly rising water, so that the screen fills up from both ends. Your scores and range of vocabulary are tracked by OpenFeint, which you can open up to view and compare against friends on the OpenFeint network. Achievements include using incremental numbers of vocabulary words, or when your “Marathon” score gets up to the 5,000 and 10,000 point ranges. Other than that, the game is limited in terms of multiplayer or unlockable content, but it’s not really meant to be anything more than a good way to pass a few minutes here and there. It doesn’t save progress so it’s best not too get too engrossed, lest you receive a phone call or text message and have to quit. At $1.99, the price tag is a little steep, but definitely worth it for fans of word games.